Posted by Mike C. in Books, Education, Personal, Photography. I was back at Leo F. Giblyn School in Freeport last Thursday to read Dr. Seuss books on the week of his birthday for the third year in a row. But that wasn’t all. 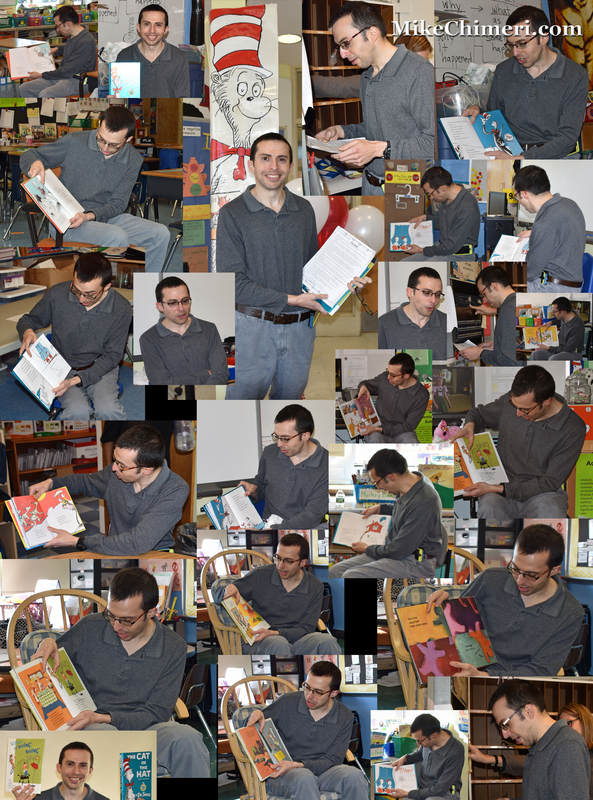 I also helped with the morning announcements by reading a Dr. Seuss-inspired poem/quiz. My delivery style received praise from teachers and students alike. I read a variety of books this year. The book I read to most classes was The Cat in the Hat. I also read Horton Hatches an Egg; One Fish, Two Fish, Red Fish, Blue Fish; My Many Colored Days; and Gerald McBoing Boing, the first book I read two years ago. As usual, I incorporated voice acting into my reading, which led to cartoon character requests afterward. I even got requests for presidential impressions. My sister Lauren told me on Friday that the school was still buzzing about me a day later. That made me beam with pride, just as I was beaming when I was there on Thursday. Thank you so much for all your help on each and every Dr. Seuss/Read Across America Day at Giblyn. Thank you especially this year! ♥ You were really the star of the day. Your talent in reading, voices, and photography ensures a successful day!